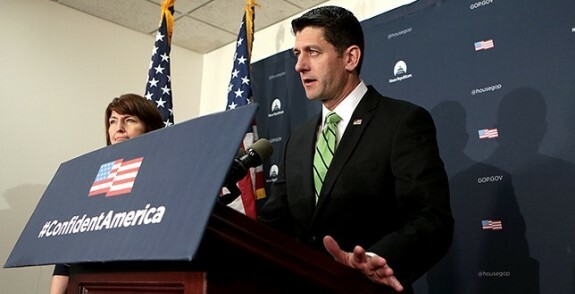 Speaker Paul Ryan and his establishment Republican “leadership” team have a problem; they want to bailout Puerto Rico’s corrupt and inefficient Democrat-led government, but rank and file House Republicans want no part of a federal taxpayer-funded bailout. Ryan’s answer to this natural outgrowth of conservative Members of Congress actually representing their constituents and the will of the people is not to withdraw the bill or put it up for a vote and let it fail, as it properly should. According to Rep. John Fleming (LA-4) what Speaker Ryan’s leadership team has demanded of House Republicans is that they betray their constituents, and indeed the very idea of a constitutional representative government, by remaining silent, refraining from asking for a recorded vote, or leaving the room when the time comes for a vote regarding the Puerto Rico debt restructuring bill. That’s right. Speaker Ryan wants your Congressman to remain silent, refrain from asking for a recorded vote, or leave the room when it comes time to vote on a bill that could cost taxpayers as much as $72 billion. Puerto Rico’s $46 billion unfunded pension liability is its single largest debt. The government pension funds are projected to run out of cash by 2019. Pension payments from the general fund would then exceed annual debt service under the proposed restructuring. Like Illinois and other liberal states, Puerto Rico has shortchanged its pensions while buying the votes of its Brahmin public-employee class. In 2003 and 2007, politicians created new public-worker retirement entitlements including Christmas, summer and medication “bonuses” (in addition to their subsidized health benefits). The pension funds have also served as a credit union for public workers. According to a 2013 audit, employees and retirees could borrow up to $100,000 for home mortgages and $5,000 for travel “to foreign countries for rest, recreation or educational pursuits.” As of 2013 such personal loans represented about a quarter of the general employees’ retirement system’s investment portfolio. In other words, one segment of the elite political class – Congress – is demanding that the taxpayers bailout another segment of the elite political class – Puerto Rican public employees. And in order to accomplish this corrupt bargain out of the light of day they need your Republican Congressman to betray you and the other limited government constitutional conservatives who voted for him or her. Fortunately, we have a few principled limited government constitutional conservatives in the House who are willing to stand against Ryan and his corrupt henchmen. "In all my time in Congress, no one has ever asked me to do something quite like this, until last night. I was angry. To be asked to walk away—to be told to miss a vote—is a request that flies in the face of every member’s conscience. Leadership had no business making such a request. Dr. Fleming is right, this corrupt attempt by one elite segment of society to force taxpayers to bailout the pension fund of another elite segment of society is the kind of politics that has brought on this year’s ballot box revolt of America’s country class. Puerto Rico’s pension fund, bondholders and those who have otherwise extended credit to the territory knew the risks and took them. It is time that Wall Street and Puerto Rico’s governing class for once faced the moral hazard of their choices without a backstop from the rest of us taxpayers. Submitted by email_registrat... on Thu, 04/14/2016 - 16:37. Need to replace all career members of the House and Senate. They are not listening to the People. Just want votes. Submitted by email_registrat... on Thu, 04/14/2016 - 12:59. Paul Ryan is a bum, in plain English. He was a horrible candidate for VEEP with Romnuts and demonstrates the total inept corrupt GOP. Submitted by email_registrat... on Thu, 04/14/2016 - 12:23. I don't remember reading an article like this when president Obama sent 100 of billions to Iran, when he offered to bailout Cuba. The problem PR is the same that many cities and states are suffering, but the laws don't allow PR to do what cities an state do. The US government used your taxes and my taxes to bailout the corrupt Wall Street Banks and insurance companies and to bailout out GM, PR isn't asking you to play for their debts they are asking to be allowed to restructure it, isn't that what GM did with your money and my. Submitted by lclobes on Thu, 04/14/2016 - 12:03. So "The Cry Baby Speaker" resigned to make room for a "dictator". How low can Ryan and his cronies go to continue to enrich the "elite"? Who is paying you off to further the cause of deceit and corruption?????? Submitted by jon exner on Thu, 04/14/2016 - 11:08. First paul ryan is as I have always believed to be a liar and a big government republican much like mcconnell in the Senate. This whole issue of the public pension in Puerto Rico as in most other states just proves that the public Unions believe that there is no bottom to the governments (local, state or federal) money pit. And I believe that is exactly how they view it, just one big money pit they can reach in and grab cash from. The sad part about this is the Unions in the private sector support these public Unions and can't see that it is they who will end up paying the taxes to bail out these public union pensions. After all public workers really do not pay taxes. The public workers would disagree with me but they forget that the money public workers use to pay their taxes is money governments collect from non-public workers. paul ryan and the establishment elected representative in both the House and the Senate should come up with programs that would force Puerto Rico to tighten their belts and begin to correct the over spending they do. Otherwise as the commercial that I have seen will become true, bail out Puerto Rico and other states like Illinois will follow suit.